Donald Trump's still standing by his Russian friends while attacking his own government's intelligence. How is that presidential? White House press secretary Sean Spicer recently refused to answer whether Donald Trump believes Russia attempted to influence our election. Spicer claimed he hadn't had an opportunity to talk to the president about it — a shocking admission, given that the intelligence community started investigating such attempts before Trump was even in office. That the Russians tried to influence our 2016 election is simply not in dispute. It is a fact, made clear over and over again through congressional testimony by current and former members of the intelligence community. There is also evidence that Russia launched cyberattacks on our voting systems in 39 states. And a majority of Americans believe it too. That Trump continues to defend Russia — and, therefore, to publicly discredit America's own intelligence agencies for all the world to see — is appalling. But it is what we have come to expect from him. Trump, during his brief time in the Oval Office, has repeatedly insulted and threatened our closest allies while praising some of the world's most brutal dictators. It is impossible to know why Trump would continue to suggest Russia's innocence. But we do know that he and others in his administration have shown no interest in understanding Russia's actions during the election. Attorney General Jeff Sessions admitted that he had not requested any briefings on Russia's interference, saying, "I only know what I read in the papers." And of course it is absurd to suggest that the Obama administration took no actions in the face of Russia's interference. In August 2016, based on evidence that Russia was trying to hack our election systems, the Obama administration attempted to designate those systems as "national critical infrastructure." Republican leaders in Congress, however, "balked" at the suggestion. Senate Majority Leader Mitch McConnell also warned the administration that "he would consider any effort by the White House to challenge the Russians publicly an act of partisan politics." 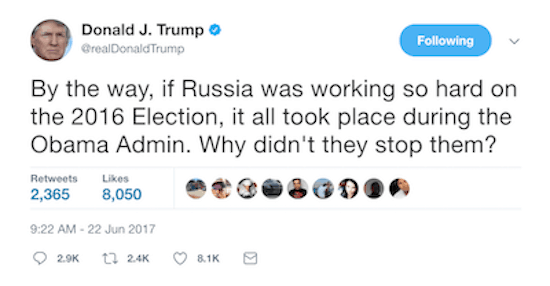 If Trump wants someone to blame for the U.S. government not doing enough to stop Russia's interference, which Trump apparently does not even believe happened, he should take a long hard look at his own party. And if he really does not believe that this happened — that a foreign government tried to hijack our democracy and install its preferred candidate in the White House — he should schedule a briefing or two with someone from any of the 16 intelligence agencies who can explain it to him. Previous articleSen. Blumenthal puts White House on notice: "There could be a potential conspiracy charge"